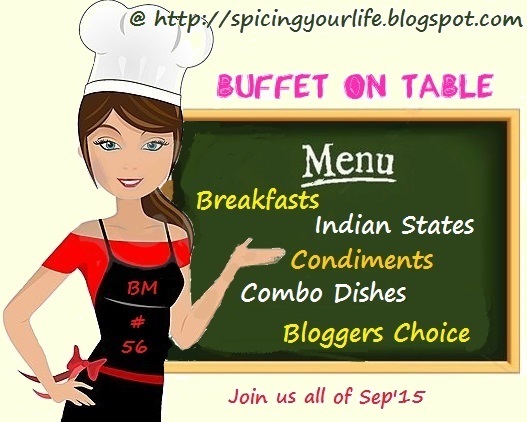 We begin the week 4 with an interesting category of mine, the Breakfast across the globe. We were supposed to being this mega marathon with this theme, unfortunately the combos scared all and we interchanged. For this week as well, I wanted to stay clear of Indian dishes, though I still picked up one from the neighboring country. 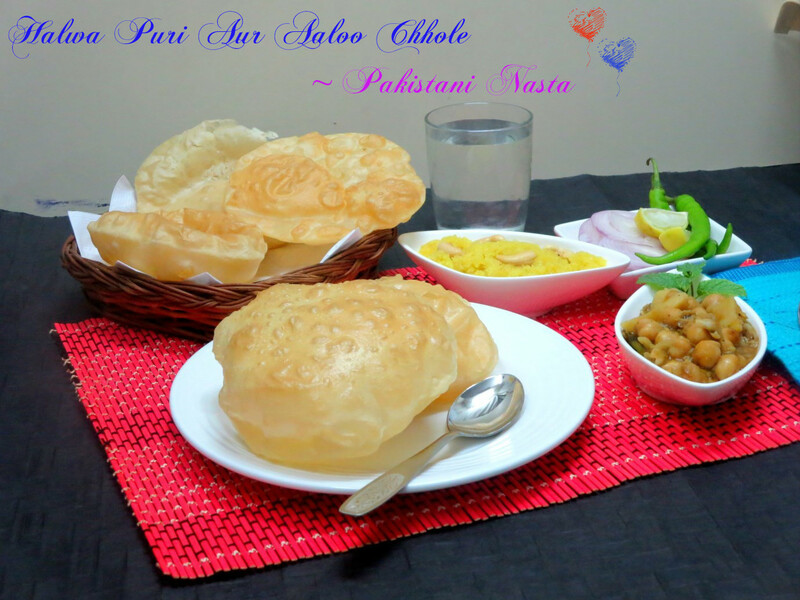 Halwa Poori Aur Aloo Chholay is a famous breakfast dish served as brunch during weekends and festival time. This tradition of serving this heavy breakfast is followed in the northern Indians states as well. I simply chose to follow the Pakistani sites for reference. These recipes are pretty much the same as how we cook. I made the chhole using the Pakistani Garam Masala and the method of cooking was also different. Naturally the end result changes, thereby giving you yet another delicious dishes for indulging. I was very particular that I select a sub theme for this Breakfast as well. My first choice was naturally Flatbreads and the Pakistani Nashta was the first one I cooked, inspired from Vaishali’s post. This was some three months ago. After that there has been so many changes in the theme and I had changed this to different weeks and them other themes etc. In between I had selected pancakes as the theme, and bookmarked a whole lot from Pavani’s beautiful collection. I had all 6 dishes shortlisted, however the one breakfast that was already done was pulling me towards it. I again ended up checking out Flatbreads for options. This category also had many options that I could cook. My other BM Buddy came to help and had already dished out quite a few. So in this week’s posts, you will see I have leveraged my friends research capabilities and I have generally been lazy. I simply cooked from their blogs. Another condition that was applied to this theme was, the dish selected should be served as a Breakfast dish in the selected country. When we served it is left to our choice right. Like I actually made the chhole for our Sunday Morning Breakfast, unfortunately Hubby Dear had to leave on an urgent work and didn’t eat breakfast. So I made the Pooris and Halwa, along with his untouched share of the Chhole. As I have said, my kids don’t eat Indian Sweets. So making Halwa for them is a wasted exercise!. However Hubby dear enjoyed this meal and said it might have been very heavy for a Breakfast. Take the flours in a wide bowl along with salt. Add the saanth and mix well with hands. Add Milk gradually and bind it to a dough. Cover and keep aside for 10-15 minutes. Make balls, roll into discs. Heat a kadai with oil, gently slide in the discs and deep fry on both sides. Drain on to a kitchen towel. 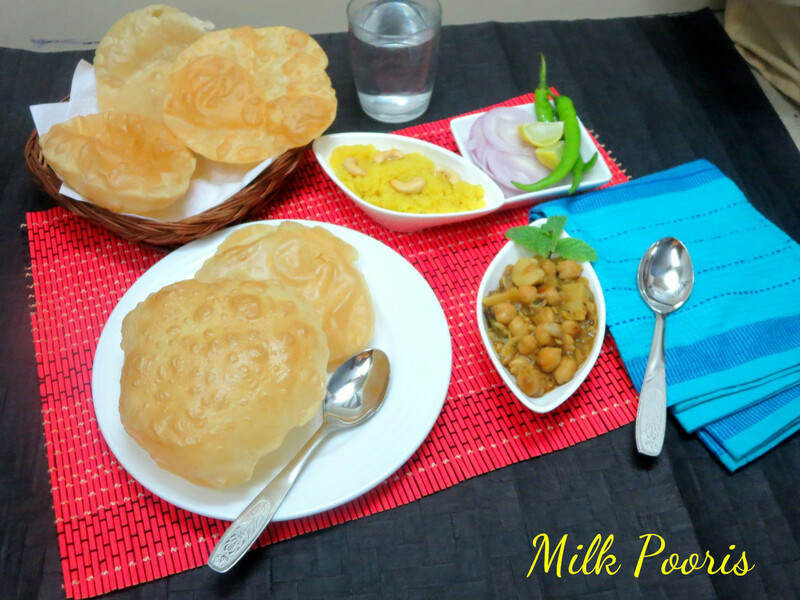 I considered halwa poori for breakfast but I know my husband would not like halwa with poori and removed it from my list. It does sound like a heavy breakfast and probably great to serve for brunch. 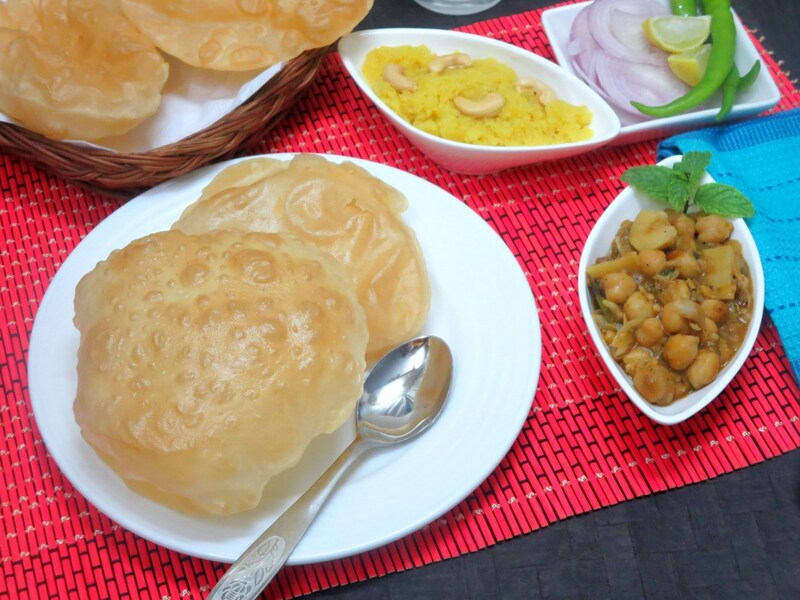 We love poori chole and halwa for breakfast once or twice in a month.That is one popular breakfast dish.Very nicely made. i made the same thing, of course without halwa ! 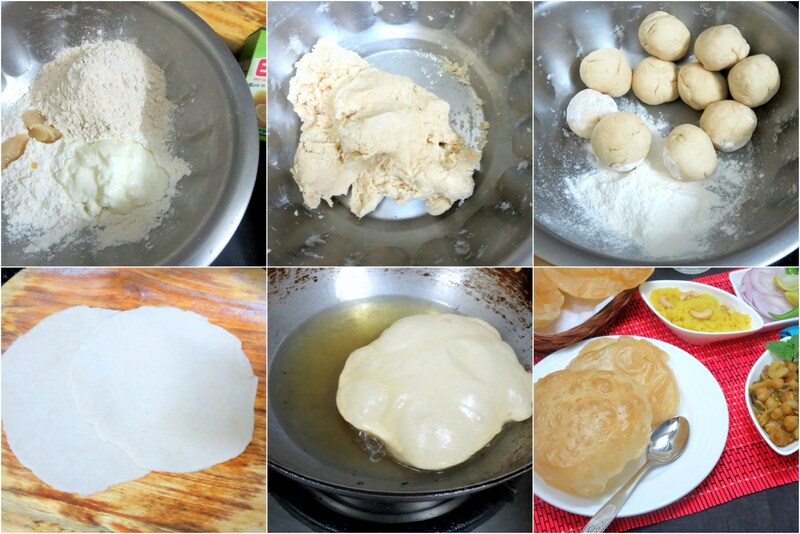 your pooris have come out great ! Awesome breakfast valli and all together, sweet n kaaram!!! this is my kind of breakfast every thing looks mouthwatering.. Interesting combo to try.Looks delicious. I did combo for the first week and totally fallen in love with this Pakistani breakfast, inviting spread again. Very popular breakfast in Punjab as well. Good one. This was on my list to make for this week. But couldn't 🙁 You guys are tempting me to try it some time soon. With so many components, this sure is a very filling breakfast. This seems to be popular combo this week. I too wanted to make it but then the break up for differnt people different stuff put me off.great choice Valli. That is one classic combo from North but I have to yet try it. The platter looks inviting. Simple and filling breakfast to start the day. This is one of those breakfasts that my kids would love to eat!